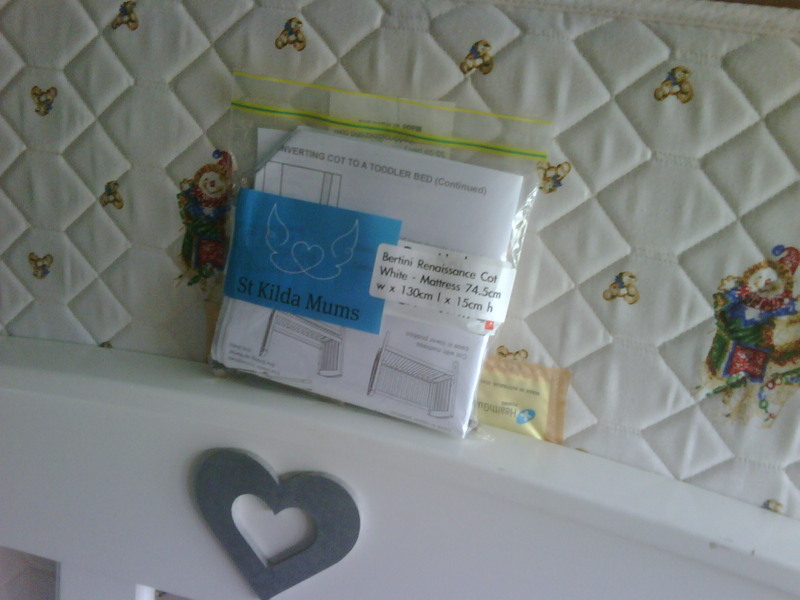 St Kilda Mums: Cot Safety - What is the big deal? Cot Safety - What is the big deal? Cot safety is a big deal. Its a big deal because when a cot that has been put together incorrectly collapses, a small baby could be seriously injured. all necessary parts in good working order. If you cannot locate this information on the base slat of the cot, this is a good indication that your cot was manufactured before 2003 and will not meet current mandatory safety standards. A cot that meets the mandatory safety standards will also have the recommended mattress size stamped on the base slat which helps us fit the correct mattress. We do re-home used mattresses, but only if they are in great condition with no marks or stains. We ask that you disassemble the cot because it is very difficult to transport a cot fully assembled. Once you have a copy of the manual, please disassemble the cot and check all the screws, bolts etc against the list of parts in the manual. It is important that the manual and screws are secured in a good quality clear plastic bag and taped to the cot securely. The product manual will be essential for the new family to be able to assemble the cot correctly. Children’s cots, especially those with movable parts like a drop side, need extra care and attention. The drop side of a cot will be used repeatedly, with some degree of force, over an extended period of time. Drop sides can become loose due to the length of use, the quality of the timber, hardware and fastenings used. Cots with drop-down sides were banned in 2012 in the United States, where they have been blamed for the death of at least 46 American children in the past decade. Cots that are re-assembled and used again can become less safe as a result of missing or loose fittings or damaged components and materials. Please check your cot carefully, check that any plastic housings for the drop side pins have not perished or become brittle with time. If there is a screw missing or a screw bent, it will have to be replaced before it can be re-homed. St Kilda Mums has relationships with many of the cot manufacturers in Australia, and can source replacement parts free of charge. It is helpful however if we can have the part ordered and on the way before you deliver the cot, to speed up the re-homing - especially when we have such a long wait list for cots. The Mandatory Standard for cots requires that the cot complies with the Australian/New Zealand Safety Standard for cots: Standard AS/NZS 2172-2003. If your cot was bought overseas (anywhere but NZ) it will not have a sticker indicating that it complies with this local standard this and we will not be able to re-home it. Supplying household cots that do not comply with the mandatory standard could make St Kilda Mums liable for heavy fines. For more details, view the ACCC website. But the risk of a fine is nothing compared to the risk to a child's safety. It is our policy to only pass on nursery gear that we would use for our own children. Thank-you for reading this and if you have any further questions or comments about cot safety, please share below. Cot safety really needs to be concerned for the safety of our baby. Comfort and safety for babies need to be fulfilled. Beside cot safety, I also try to take care of my babies comfort by using natural cot mattress for comfortable sleep. Giving safety to the baby by cot products like the baby Cot mattresses and other is very concerned topic because many of the babies died due to drop side. St Kilda Mums Inc. 2009. Picture Window theme. Powered by Blogger.